A surge of volunteer spirit assists co-workers in the aftermath of Hurricane Harvey. Peering out the window on Sunday morning, Senior Accounting Manager Ed Caminos no longer saw the street, but rather a wide avenue of water connecting the houses like a private canal. Over 24 inches of rain had fallen in just two days and now Ed and his family were stranded inside their home, keeping a close eye on the news as Hurricane Harvey stubbornly stayed put. In the late summer of 2017, Hurricane Harvey broke a 12-year streak of no major hurricanes making landfall in the United States. After dumping more than 40 inches on much of the area across four days, Harvey earned the title of both wettest tropical cyclone on record and costliest, with nearly $200 billion in damage. 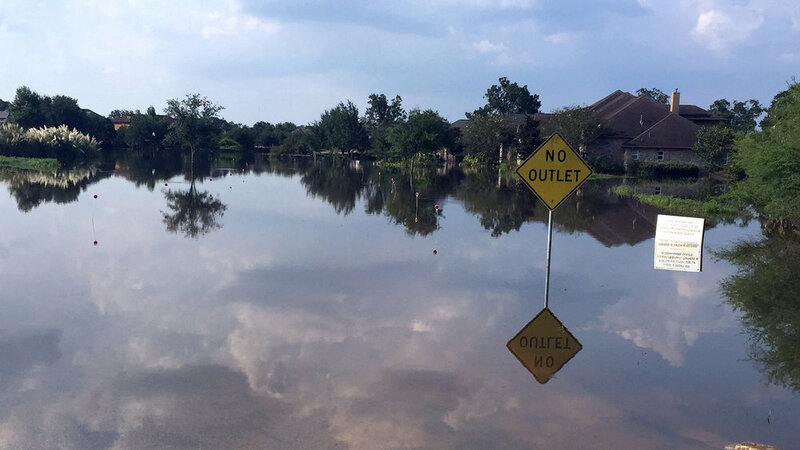 The Caminos family was hopeful the water level would begin to recede in the coming days, but then the news broke that flood waters were entering the Barker Reservoir faster than the dam was releasing water downstream. To avoid catastrophic flooding downstream, the dam would maintain a controlled release and neighborhoods upstream of the Barker Reservoir, like the Caminos’, would see more flooding. At the house of Financial Controller Diana Monaghan and Subsea Systems Manager Roy Mills, a similar story emerged. The drainage ditches and retention ponds kept up with the rain on Saturday, but by Sunday morning the retention areas were full and water began to rise and flow towards the house. Diana and Roy made the decision to hook up their RV while there was still time and evacuated to Waller County. The Caminos family worked quickly Sunday afternoon to move possessions to the second floor. The next morning Ed decided to evacuate his house and told his wife and two children to pack up one garbage bag full of possessions to take with them. The family struck out in the Monday afternoon rain with bags and family dog in hand, and waded down the streets of their neighborhood over a mile to higher ground where extended family came to pick them up. Diana and Roy were able to keep tabs on their house via remote security camera and saw by Tuesday that flooding of their home was unavoidable. Arriving after midnight, they drove to where the road disappeared under the rising water and waded through waist-deep water in the dark to reach their home and take or preserve possessions likely to be flooded. Neither Diana and Roy nor the Caminos family would see their homes again until several days later when the water receded. When Ed finally walked through the front door again, the water line on the walls showed there had been at least 24 inches of water in the home and everything on the first floor was ruined. These decisions of sheltering in place until evacuation was unavoidable, or evacuating before the storm and fearing how much the water was at the doorstep, were experienced by thousands of residents. One of the biggest challenges during a natural disaster is effectively communicating with employees when the office is closed. Employee Services Director Priscilla Heistad explains “Noble’s mass-communication solution is able to send simultaneous voice, text and email alerts to employees as needed during a natural disaster. Having a communication tool ensures that everyone receives company updates at the same time is crucial.” More than 30 Noble employees suffered flood damage or displacement. Employees kept in touch from the start, via text and email, checking to see who was flooded or needed help.